One of the first things I did when we were discussing an Occupation in Philadelphia was to visit the site of the original Occupation, the one near Wall Street. We, uh, assembled a bit of a crowd to begin our Occupation in early October. Monique Frugier took thi s and other photos on her own site. Dave Onion did a set of photos on flickr. The same day, Roy Batty defended Occupiers against the charge that they were unfocused. On the 11th, Philly Against War advertised its' upcoming anti-war demonstration that was to occur on the 15th. We featured the demonstration of the 13th the next day. 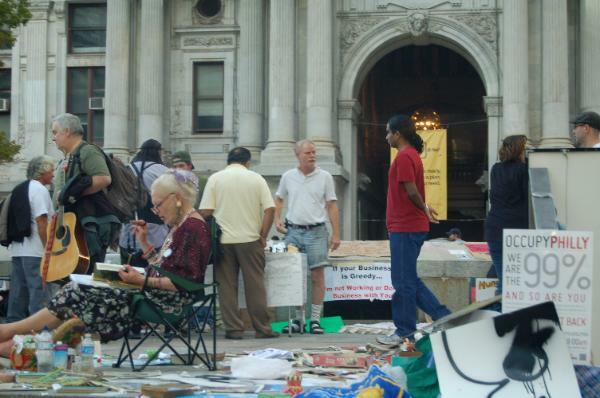 Brandywin Peace Center decided to conduct a once-a-week protest at the Philly Occupation. On the 28th, Craig Louis Stehr contributed the rather impractical idea that Occupiers should shift people between cities. Problem: Occupations have frequently changing members in any event, so it's doubtful authorities would even notice Occupiers shuttling between encampments. Stehr later redeemed himself with a good report on Occupy DC. Awaiting eviction - the authorities of course waited until a few days later to actually evict us. Marching to the Roundhouse post-Dilworth Plaza. The Occupation movement may change shape and tactics, but it's not over by a long shot.